The Shiners went 2 for 2 on the Varsity level this weekend and evened their record up on the season at 7-7. After a strong defensive effort the night before at Madison Shawe, the Shiners were able to display their defensive prowess at home against Waldron on Saturday night, holding another opponent under 50 points by winning 70-47. The Shiners tried to get separation in the first half and were able to get thier lead up to 16 points, however a few lapses by the blue and white allowed Waldron to close the lead down to 11 at Halftime. When the Shiners were done with their work in the 3rd, leading 49-31, the only thing left to be determined was how much the Shiners would win by. The Shiners were led by Senior Forward Nick Koons with 19 points and Senior Forward Wesley Rider who came off the bench for 13 points. 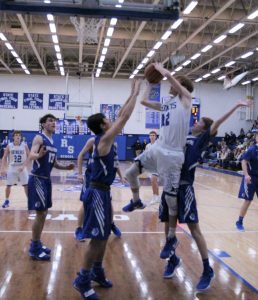 Mohawk point Guard Parker Huffman led Waldron with 19 points of his own, while 6’6″ post player Zane Smith was held to 2 points in the game thanks to some stellar defense in the post by RS big men TJ Manifold and Wesley Rider. The Shiners (7-7,1-1) play Thursday, January 31 at Milan for their 3rd conference game of the year. JV action starts at 6:00 pm with Varsity action to follow.